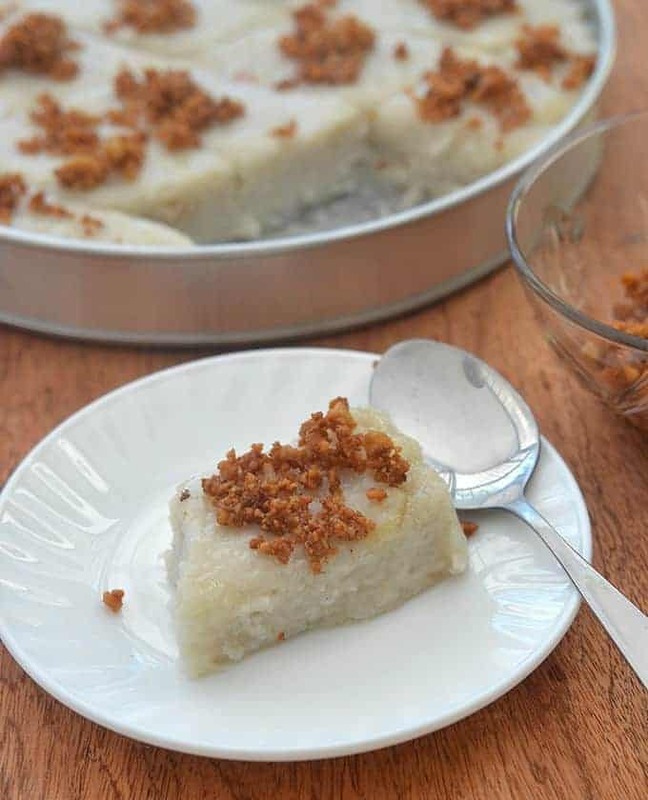 Kalamay Gabi with glutinous rice flour and taro is the ultimate Filipino rice cake. Sweet, creamy and loaded with coconut and taro flavor, it’s delicious nashville filipino food as a snack or dessert. Along with kapit and tibok-tibok, this kalamay gabi was one of the things I learned to make during my trip to the Philippines last November. A family friend who owns a kakanin stall in our local wet market came to my mother’s house to show me the steps, and I wish now I had more than one day to work with her as she knows all sorts of rice cake recipes I would have loved to try. Kalamay gabi is a type of Filipino delicacy made of glutinous rice flour, taro or locally known as gabi, and coconut milk. Like other kakanin, it’s usually served as a snack or dessert. The ingredients are cooked in a wide pan over a medium-low flame until thick and sticky. The mixture is transferred to a serving pan or a banana-lined wooden bamboo platter (bilao) for a more traditional presentation and then topped with golden coconut curds (latik) to add an extra layer of flavor and texture. 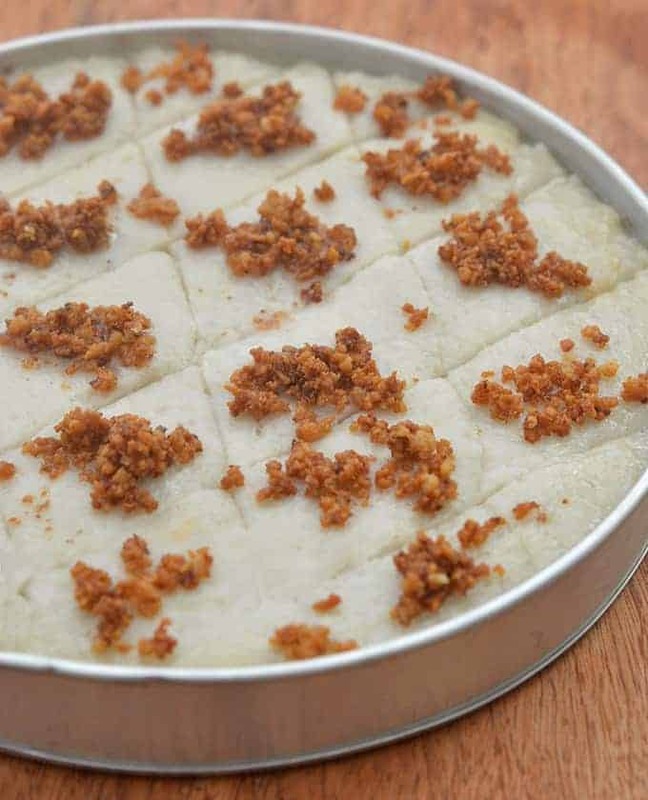 If you’re from the Pampanga region, you probably know this rice cake as kalame gandus. Please note that while other versions are similar to halayang ube, this recipe here results in a chewier consistency due to the addition of glutinous rice flour. Are Gabi and Ube the Same? Although these two tubers are often confused with each other and can be used interchangeably in certain recipes, they’re actually different root crops. Gabi comes from the taro plant and is often cooked up in sweet desserts such as Visayan binagol or savory dishes such as sinigang. Depending on the variety, the size can range from small to large and the color from creamy white to purple-flecked. Ube, on the other hand, is a species of yam and it’s distinguished by its color which can range from purple (hence the name purple) to lavender. This tuberous vegetable is used in various desserts such binignit as well as flavoring for ice creams, cakes, cookies, candies, and bread. Use a non-stick pan and a sturdy wooden spoon to make stirring easier. While cooking the kalamay, start making the latik as you will need the rendered oil to brush on the serving pan. If you’re storing the rice cake in the refrigerator, skip the brushing of coconut oil. Bring the kalamay to room temperature first before applying the oil as it will harden to an unappetizing film of fat. 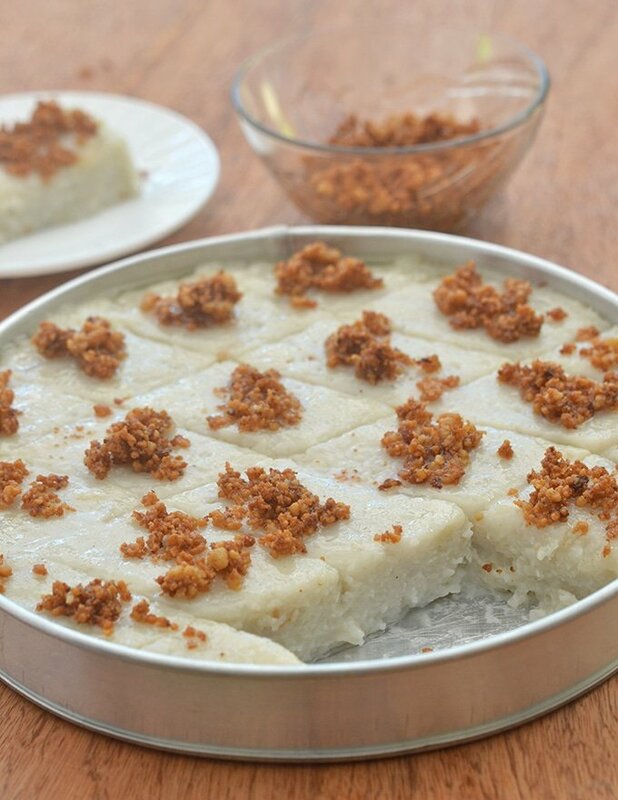 Kalamay Gabi with glutinous rice flour and taro is the ultimate Filipino rice cake. Sweet, sticky, and loaded with coconut and taro flavor, it's delicious nashville filipino food as a snack or dessert. In a pot over medium heat, place gabi and enough water to cover. Bring to a boil. Cover and cook until fork tender. Drain gabi from the water and allow to cool. Peel and shred the flesh. You'll need 3 cups of shredded cooked gabi. In a wide non-stick pan, combine coconut milk, and glutinous rice flour. Whisk together until well blended. Over medium heat, cook, stirring frequently, for about 15 to 20 minutes or until mixture begins to thicken. Add shredded gabi and sugar. Stir well to fully incorporate. Continue to cook, stirring regularly, for about 40 to 50 minutes or until mixture is smooth and very thick and can be hardly lifted from the pan. Brush the bottom and sides of the serving dish with coconut oil. Transfer the kalamay mixture into the prepared pan, using a lightly oiled knife or spatula to smooth top. Brush surface with coconut oil and top with latik. In a pan over medium heat, add coconut cream and bring to a boil. Cook, stirring occasionally until liquid starts to thicken. Lower heat and continue to cook. As oil starts to separate and solids begin to form, regularly stir and scrape sides and bottom of the pan to prevent from burning. Continue to cook and stir until curds turn golden brown. Drain latik from the oil and store in a container until ready to use.